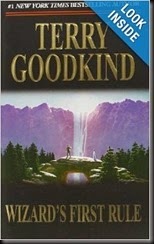 Often people will start reading a series with book number one. “You can begin with any story,” I’ll tell folks interested in reading my Bad Hair Day series. But they insist on starting at the beginning. “That’s fine,” I’ll say, but is it really? I am thinking how that first book is not the best example of my writing skills today. How long ago was it published? In 1999. And the book had probably been in production for a year before. So that means I wrote it sixteen or more years ago. Don’t you think my writing has improved since then? Yet here is this potential fan evaluating my entire series based on that one book. You’d hope she would cut me some slack. At least I got the rights back to my early futuristics. I revised those stories before making them available in ebook formats. No problems there. I do not have the same opportunity with my mysteries. But even if I did, would it be a good use of my time to revise all of my earlier stories? Or is it best to leave them in their pristine state, an example of my earlier writing style? If so, let’s hope that the readers out there coming to my series for the first time will approve and understand. Sometimes the opposite is true. 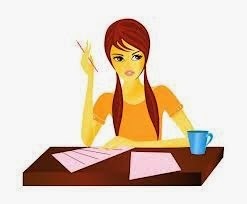 A writer’s early works are his best efforts, before he gets rushed to meet deadlines or to quicken production. In such cases, the later writing might suffer. I’ve seen this happen with some favorite authors. So what do you think? If you want to read a new series, do you begin with book one or with the latest title? Now for some BSP. My new book, Warrior Lord (Drift Lords Series #3) is being released on Friday, August 1. Usually when I’m giving advice to aspiring authors, I name the 3 P’s as Practice, Persistence, and Professionalism. In his recent post, James Scott Bell mentioned his 3 P’s for writers: Passion, Precision and Productivity. These are all valid and equally important. It helps if you set a daily word count or page quota and a weekly quota, then put yourself on a strict writing schedule. This gives you definitive goals. Keep moving forward. If you get stuck, either you haven’t laid the proper groundwork or you are letting outside distractions snag your attention. Don’t get hung up on self-edits until you finish your first draft. It’s easier to fix what’s on the page once the story is complete. The point here is to write on an ongoing basis. Then follow James’ advice about Precision by learning how to hone your skills. Attend writing conferences. Read Writer’s Digest. Enter contests with feedback. Join a critique group. Go to meetings of your local writing group and sign up for workshops. And keep writing. Persevering at this career despite rejections, bad reviews, poor sales, and other setbacks is critical to success. If you drop out, you have only yourself to blame. Keep at it, and your skills will improve along with positive responses from readers, critique partners, and editors. 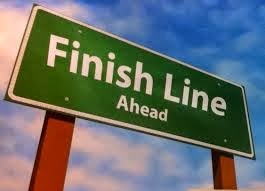 “Never give up, never surrender.” That holds true for a writer same as for the crew of Galaxy Quest. Have faith in yourself. If you have the drive to write, you can improve your craft and learn marketable skills. The more books you have out there, the more chances you have to gain a following. Keep going despite the odds, and be versatile. At times, you may have to try something new and different. Don’t be afraid to take risks. Whichever route you take, quitting isn’t an option. Always be polite and gracious, even when you get a bad review or a rejection. It’s hard not to take these personally, but they’re aimed toward your book and not you. You don’t want anyone saying you’re a gossip or you bad-mouthed your publisher or you made condescending remarks toward another author. It’s better to be known as someone who shares her knowledge, is helpful to her peers, and is a consummate professional in her dealings with editors and agents. 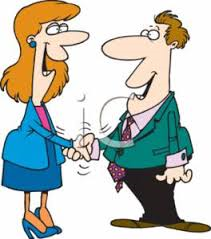 If you need someone to hold your hand, turn to your critique group and not your publisher or agent. With their busy lives, these people don’t care to take on needy writers. They want career authors who will persistently turn in polished manuscripts, who establish and maintain a platform, who are active online, and who understand the publishing world. Act toward others as you’d wish to be treated. You never know when a writer friend from today might become your editor tomorrow, or an editor might become an agent, or a reviewer who raked your previous books over the coals might give you a rave review. The old adage, “Don’t burn your bridges,” holds true here, too. Be polite, courteous, and helpful at all times. Follow the P’s along the track of your writing career. If you have to step off for a brief interval, be sure to hop back aboard the train before it gathers speed and steams ahead. While researching my mysteries, I often need information that you can’t go around asking writer friends in public. Imagine discussing these topics in a restaurant. What kind of poison can I use that will kill someone right away and is easily obtainable? How can I stage a crime scene by hanging the victim to make it look like a suicide? Does firing a .38 give much of a recoil? What happens when a detective is personally involved in a murder case? What kind of poisonous snake can I have the bad guy put in my hero’s suitcase? Often, I’ll need specific advice to help me set the scene with as much authenticity as possible. Fortunately, mystery writers have a range of resources available besides your friendly cop on the local force. These are some of the sites where you can get useful information and answers to your research questions. Also listed are well-known mystery conferences. Check out the links. They’ll lead you to informative websites and blogs. 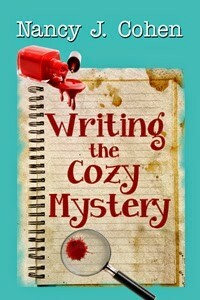 Note that most of these are listed in my writing guide, Writing the Cozy Mystery. What sites do you find helpful in your crime-related research? 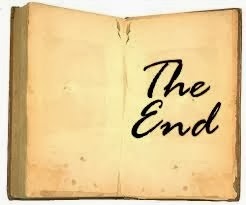 Creating a hook at the end of a chapter encourages readers to turn the page to find out what happens next in your story. What works well are unexpected revelations, wherein an important plot point is offered or a secret exposed; cliffhanger situations in which your character is in physical danger; or a decision your character makes that affects story momentum. Also useful are promises of a sexual tryst, arrival of an important secondary character, or a puzzling observation that leaves your reader wondering what it means. This character is looking back from future events rather than experiencing the present. As a reader, you’ve lost the sense of timing that holds you to her viewpoint. You’re supposed to see what she sees and hear what she hears, so how can you see what hasn’t yet come to pass? Although these examples are given in first person, the same principles apply to third person limited viewpoint. Your reader is inside that character’s skin. She shouldn’t be able to see/hear/feel beyond your heroine’s sensory perceptions. By dropping hints about future events, you’re losing the reader’s rapt attention. Stick to the present, and end your chapter with a hook that stays in character. Personal decisions that have risky consequences can also be effective. For example, your heroine decides to visit her boyfriend’s aunt against his wishes. She risks losing his affection but believes what she’s doing is right. Suspense heightens as the reader turns the page to see if the hero misinterprets her actions. Or have the hero in a thriller make a dangerous choice, wherein he puts someone he cares about in jeopardy no matter what he decides. Or his decision is an ethical one with no good coming from either choice. What are the consequences? End of chapter. Readers must keep on track to find out what happens next. In a romance, end chapter with one viewpoint, and switch to partner’s viewpoint in next chapter. Or end a scene of heightened sexual tension with the promise of further intimacy on the next page. How do you drop hints for a sequel into your current story, not only to let readers know more books are coming but also to whet their appetite for the next installment? You can (1) title your book as part of a series, (2) include an excerpt for the next book after the last chapter, (3) plant clues foreshadowing another problem to come, or (4) drop an overt hint toward the end of your story. 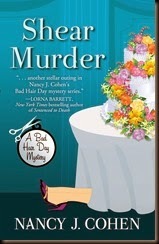 Number four is what I did in Hanging By A Hair, book #11 in my Bad Hair Day mysteries due out on April 18th. 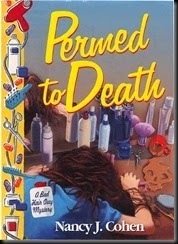 At the end of this story, I drop a hint that leads directly to the sequel, Peril by Ponytail. 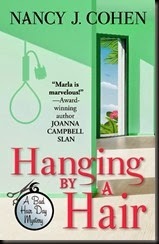 The mystery in Hanging By A Hair is solved, so readers go away satisfied, and the main character learns a lesson. But anticipation is half the fun, and I’m hoping fans will be eager for the next installment. I did the same thing in Killer Knots when Marla announces she and Dalton have set a date for their wedding. That leads into Shear Murder, the wedding story and #10 in my series. But what if you haven’t plotted the sequel, written the first chapter for it, or even planned on one? And then suddenly readers are demanding the next book. What do you do? First plot your overall series story arc for the next few books. Identify the main characters. Is this a series with a single protagonist in each volume, or are the stories spin-offs, wherein secondary characters in one story become the heroes in another? Either way, try to determine what personal issues will be driving these people in the next book. Write the opening scene to get a feel for the story. Now go back to the WIP and look for places where you can drop in hints of what’s to come. In the Drift Lords series, a sweeping battle between good and evil is heralded. What happens after this battle when my heroes triumph? Is the series over? Not necessarily, because you all know that after one bad guy goes down, a worse one pops up to threaten humanity. Spoiler Alert! I created an unusual situation by writing my first three books in chronological order because the story comes to its rightful conclusion in this trilogy. The next three books, as I’ve planned it, will take place in the same time period as books 2 and 3. I know it’s confusing, but bear with me. What will make this next set of books special, if fans know our main villains get vanquished in book 3? It appears our Drift Lords are not finished just because they’ve prevented disaster. A worse villain awaits them around the corner. I created a new story arc for books 4 through 6. Look at Star Wars. George Lucas made a wildly popular trilogy. Then he did another 3 movies, calling them prequels. Now the series will continue with a new story line into the future. I drop hints in Warrior Lord (Drift Lords book #3) for the next trilogy in my series. I see them as sets of three with the potential for a total of seven or more. And like Terry Goodkind’s excellent Sword of Truth series, just because one nasty bad guy is defeated doesn’t mean there aren’t more waiting in the wings. Is evil ever truly vanquished? Do you like hints of what’s to come in stories subsequent to what you are currently reading? I’m not talking cliffhanger endings here. I hate it when the main story isn’t finished, and you have to wait for the sequel. But personal issues can continue in the next installment, or new problems might arise that cause trouble. One has to be careful not to frustrate the reader by leaving too many threads loose, but it’s good storytelling to offer a teaser about what may be in store. Just make sure you bring the current story to a satisfying conclusion. Recently I have released my first nonfiction title. This came about because numerous aspiring authors kept asking me how to write a mystery. 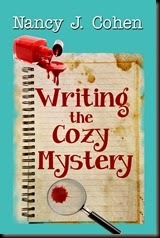 So I compiled my teachings into an easy-to-read booklet with concise instructions on Writing the Cozy Mystery. Here is a distillation of the steps I followed to produce this work. Please note that today I am en route to Orlando for SleuthFest, and I may not be able to reply to comments in a prompt manner. I will look at them later and do my best to respond in a timely fashion. Hire a story development editor and a copy editor. Polish your work to perfection. Insert front and back material into manuscript. Create a publisher name and register with your State as “Doing Business As” title. Or create an LLC if you prefer. Check with your accountant for more info. Put a Legal Notice in your local newspaper if required by the State. Apply for a county business license/tax receipt. Note: if you’re 65, you may be exempt from fees but you still have to apply. Renewal is annual. Open a business bank account under DBA title. As sole proprietor, you don’t need an EIN number. Use your own SS number. Order checks for new account. Buy ten ISBNs from Bowker.com. 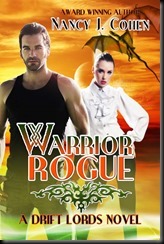 Hire a cover designer for ebook cover and trade paperback cover. Determine book price for digital edition. Assign an ISBN number to the digital edition at MyIdentifier.com (if you’ve bought them from Bowker). You will need to upload the cover and give the price. Hire a formatter after inserting the ISBN into your copyright page. Note that the print edition will have a separate ISBN from the ebook edition so you’ll need to send the formatter two different files or pay for a correction later. Upload your e-book to Amazon, Apple, BN, Kobo, Smashwords, AllRomanceEbooks/OmniLit. It may be easier to hire your formatter to upload to iBooks since I believe you need to own an Apple device to do this step. *File for copyright now so you don’t have to send two print books to the copyright office. Upload to Createspace for a print edition. If you use their ISBN, you can sell your CS book to libraries. If not, librarians will have to get your book through another source or buy it through normal channels. Consider Lightning Source and Espresso Machine as other print options. Consider an audio edition via ACX with another ISBN assignment and a cover resized to this format. Order print materials to promote your work, i.e. bookmarks, postcards, etc. 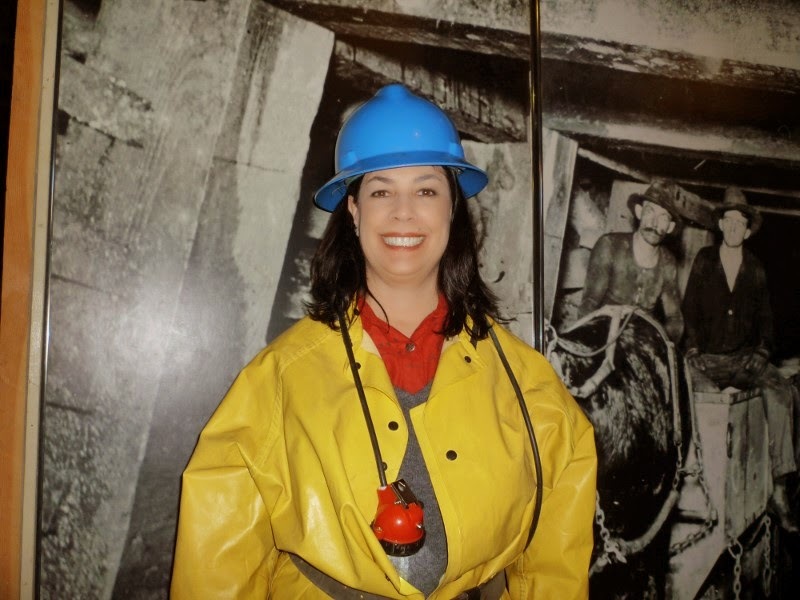 Consider doing a virtual blog tour. If you set a particular release date, hold an online launch party. Post your release news and book cover on all your sites. Consider if you want to give away free copies or promote a bargain/sale price. Join indie author forums online for more tips. Obviously, marketing could be a whole other topic as could each one of these sections. I do plan to blog about this process in more detail at a later date on my personal blog. Meanwhile, these steps will get you started in the right direction. Those of you who have been through this journey might have more to add.